This was in the context of increasing mobilizations by tenants, unions and neighbourhood groups against the wave of corporate buyouts and evictions for property speculation and gentrification in the city. Finally it took vanloads of police, cutting of streets, brutal police charges and four arrests to protect the illegal actions of the hired goons and evict the premises. Later the same evening a demo was held outside the police station where the 4 victims were held, one was a supporter oj the street and the other 3 were from the occupiers collective.. The building, located between the streets Piquer and Fontrodona, has been ‘completely renovated’ after the renters were evicted, breaking their contracts, in 2013. 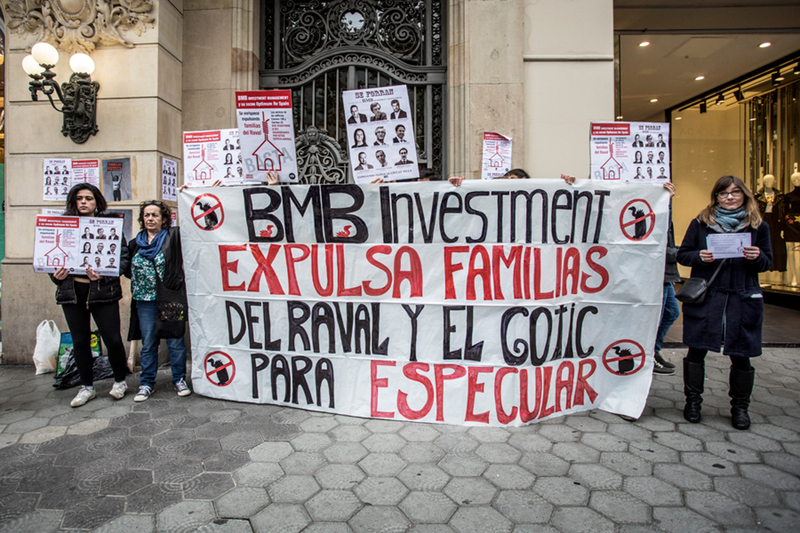 Neighbours who had lived their whole lives there were forced to abandon their homes, according to sources from the Poble-sec District Syndicate and currently the flats are advertised by the Vivendex luxury real estate company as ‘high level’ apartments . The block was occupied just a few days ago by a group of young people (although the action had not been publicized), one of whom announced that they would make a court case against the company Desokupa, as they were attacked by their employees. 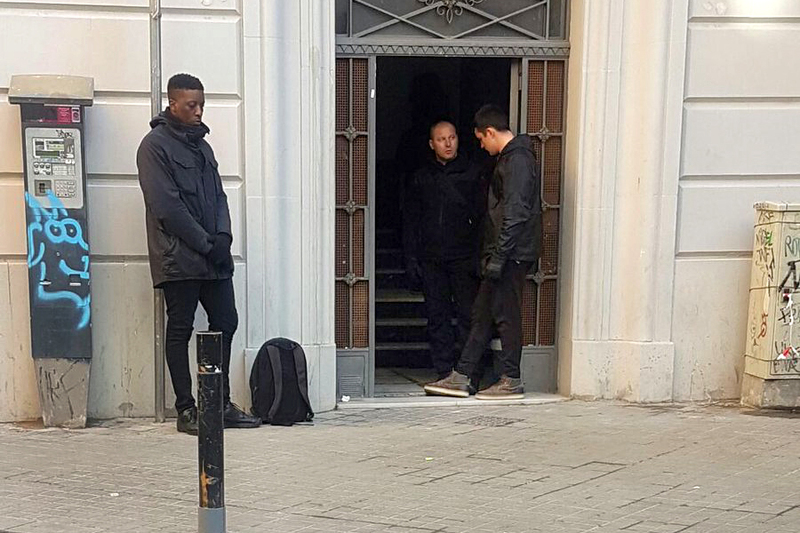 According to some eyewitnesses, from about eleven o’clock in the morning, three Desokupa employees were planted at the door of the building, doing the tactic they call “access control”, that is, preventing anyone entering and pressuring anyone inside. Later, as explained by the same witnesses, Daniel Esteve, founder of this company of express evictions, appeared. At the request of the occupants of the building, a Patrol of the Mossos appeared, but after a short time left. KrasnyiBCN‏ @KrasnyiBcn Jan 15KrasnyiBCN Retweeted Acció Llibertària de Sants#AlertaDesokupa Tres detingudes avui al Poble Sec després que l’empresa Desokupa hagi dut a terme un desallotjament il·legal amb la col·laboració dels Mossos d’Escuadra. S’ha convocat una concentració davant de la comissaria de les Corts a partir de les 19.30h. In a short space of time more than a hundred neighbors gathered around the building, at the two ends of Fontrodona Street, following the call that several housing rights defense groups made through social networks witrh the tag #AlertaDesokupa. Early in the afternoon, up to four vanloads of the Mobile Brigade (Brimo) riot police arrived at the scene, and there have been several police charges and moments of great tension. At that time Desokupa agents were able to access the building and the group of occupants had to leave, with 3 arrests . Some of them have announced the intention to file a complaint against the company for evictions for assaults. 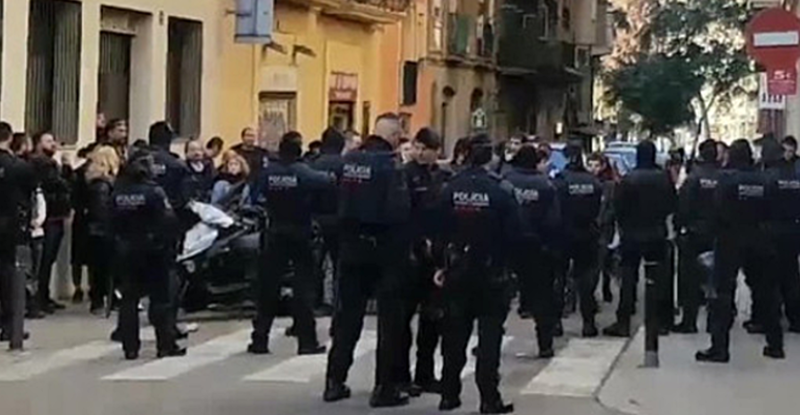 In the afternoon, the Catalan police officers made a cordom around the estate in which there were Desokupa employees; “They are waiting for the moment to remove them without making any noise,” explained a witness. 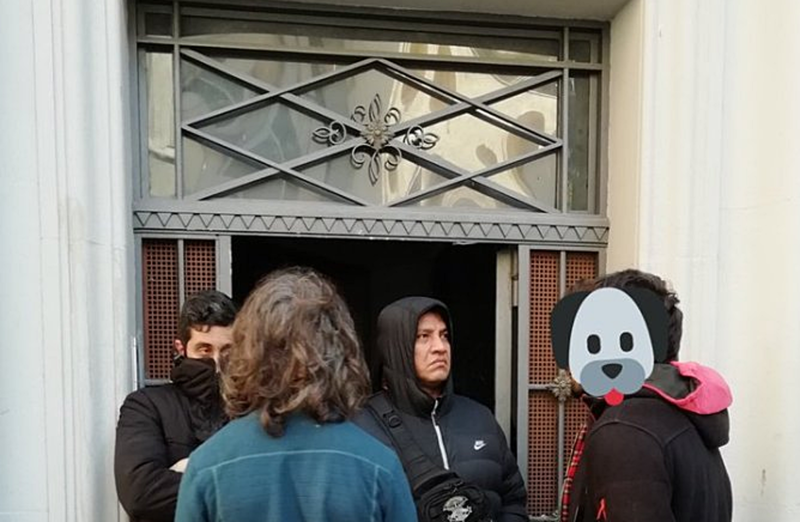 Police closed off streets around the eviction and protected instead of arresting the illegal thug evicters ..El desalojo se ha producido en unos apartamentos de la calle Piquer esquina Fontrodona. During the charges police officers arrested a person to whom three more arrests were added from the group occupying the evicted block . 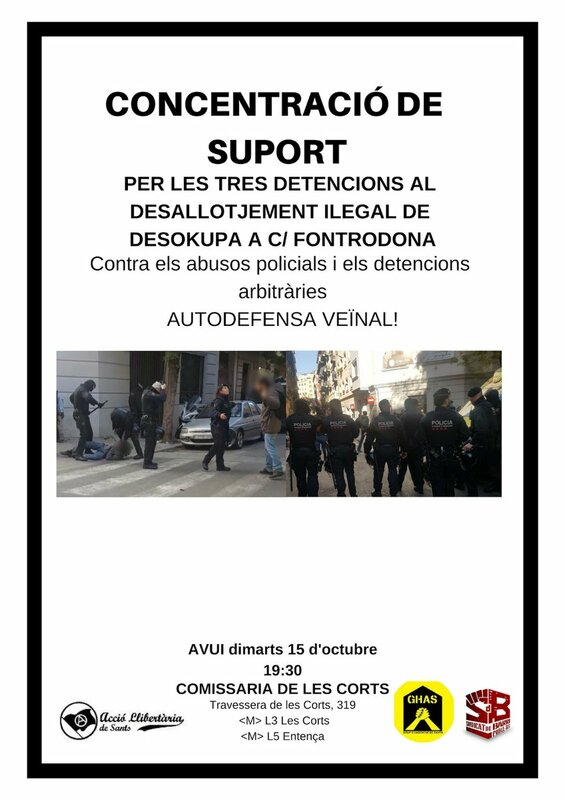 The detainees were transferred to the police station of the Mossos d’Esquadra in la Travessera de las Corts, where a support concentration was held at 19.30. The property of number 11 of the Fonrodona street changed ownership in 2013. According to one of the neighbors living there until that date, in November of that year, all the tenants (who paid around 700 euros to the month of rent) received a letter announcing the rupture of the contract by the property and ordered them to abandon the apartments before the end of the year. Since then they have been subjected to a comprehensive reform in order to be publicized on the website of the Vivendex group as high-standing apartments. Vivendex is a real estate group founded in 2007 with divisions in Reus and Barcelona, ​​specialized in high-end promotions, many located in the most expensive neighborhoods of the city, and also in the reform of buildings with legacy assets to transform them into luxury residences (the Moxó Palace, in the Gothic Quarter of Barcelona, ​​has just been sold). Its chief executives (CEOs) are Manuel Roger and Francesc Quintana Ramos (listed in the Mercantile Registry as company administrator, together with Alejandro Galcerán Homet). Quintana opted for the presidency of the Association of Real Estate Agents (API) last November, but lost the elections. Segons alguns testimonis presencials, des del voltant de les 11 del matí, pel cap tres empleats de Desokupa s’han plantat a la porta de la finca, fent la tàctica que anomenen “control d’accés”, és a dir, impedir que ningú hi entri i pressionar qui és a dins. Més endavant, tal com expliquen els mateixos testimonis, ha aparegut Daniel Esteve, fundador d’aquesta empresa de desallotjaments exprés. En poca estona s’ha anat concentrant al voltant de l’immoble més d’un centenar de veïnes, als dos extrems del carrer Fontrodona, seguint la crida que diversos col·lectius de defensa del dret a l’habitatge han fet a través de les xarxes socials mitjançant l’etiqueta #AlertaDesokupa. Des del Sindicat de Barri del Poble-sec es destaca la capacitat de reacció del veïnat i es puntualitza que “no acceptarem aquest mètode d’actuar basat en la coacció i l’amenaça, i tants cops com vinguin tornarem a reaccionar”. A primera hora de la tarda, fins a quatre furgonetes de la Brigada Mòbil (Brimo) dels Mossos s’han personat al lloc dels fets, i s’han produït diverses càrregues i moments de molta tensió. En aquell moment els agents de Desokupa han accedit a l’edifici i el grup d’okupants n’ha marxat. Algunes d’elles han anunciat la intenció de presentar una denúncia contra l’empresa de desallotjaments per agressions. 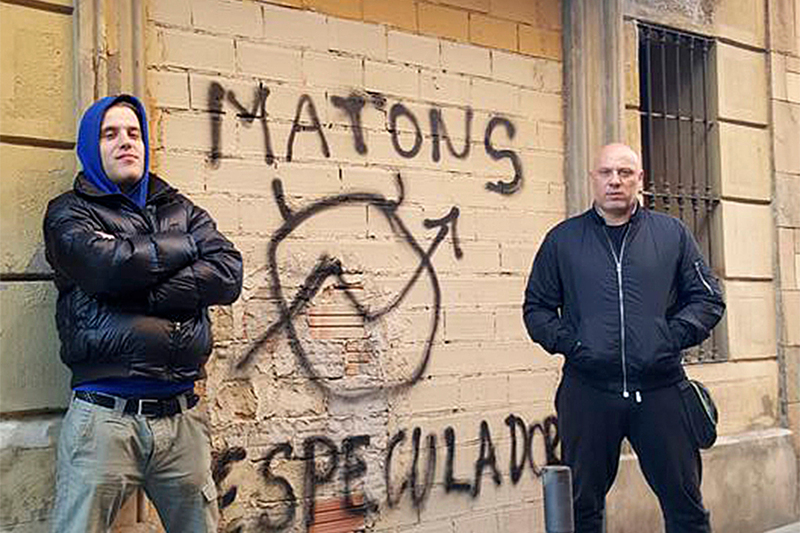 A Poble Sec aquesta tarda estem veient com la màfia paramilitar de @desokupa està fent fora gent de les seves cases en col·laboració amb els @mossos.Una nova agressió a les classes populars de la mà de @MiquelBuch i @QuimTorraiPla. A mitja tarda, els agents de la policia catalana havien fet un cordó al voltant de la finca dins la qual hi havia els empleats de Desokupa; “estan esperant el moment de treure’ls sense fer soroll”, explica un testimoni presencial. Durant les càrregues, tres persones han estat detingudes i traslladades a la comissaria dels Mossos d’Esquadra de la Travessera de les Corts, on s’hi ha convocat una concentració de suport a 2/4 de 8 de la tarda. 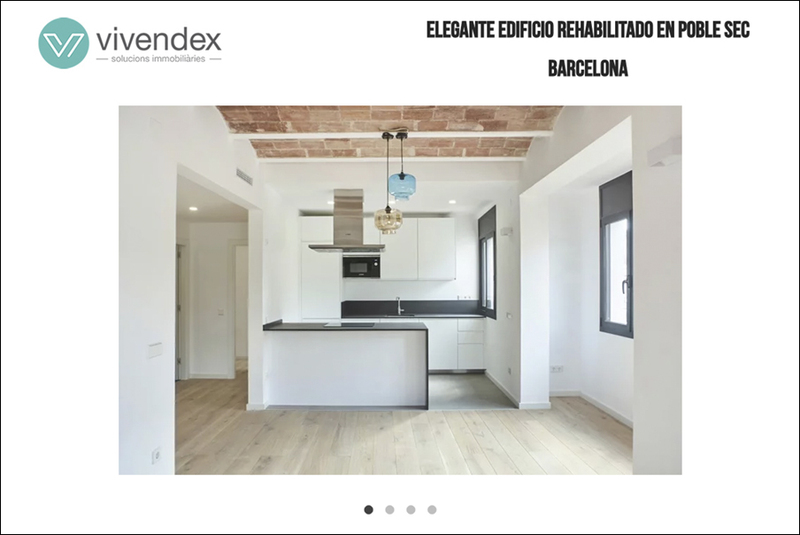 Promotion for the redecorated now -luxury apartments-.Així es promocionen els pisos al web de Vivendex. Vivendex és un grup immobiliari fundat l’any 2007 amb divisions a Reus i Barcelona, especialitzat en promocions de gamma alta, moltes situades als barris més cars de la ciutat, i també en la reforma d’edificis amb llegat patrimonial per transformar-los en residències de luxe (recentment han posat a la venda el Palau Moxó, al Barri Gòtic de Barcelona). Els seus principals executius (CEO) són Manuel Roger i Francesc Quintana Ramos (que figura al Registre Mercantil com a administrador de l’empresa, juntament amb Alejandro Galcerán Homet). Quintana va optar el novembre passat a la presidència del Col·legi d’Agents de la Propietat Immobiliària (API), però va perdre les eleccions davant del candidat afí a la junta anterior.